The Bissell DeepClean 36Z9 is a powerful machine made especially for homes with pets. However, it can be your favorite carpet cleaner even if you don’t own cats and dogs at the present time, but still your carpet gets dirty from time to time with different types of contamination. This machine is equipped with many different tools to provide you with the best solution for every debris and dirt problem. Its counter-rotating PowerBrushes, technologies like HeatWave and CleanShot, specific tools for pet owners, and other useful features make sure you have everything you need to clean out all kinds of dirt and debris. This review will show you the advantages and disadvantages of this Bissell machine. The PowerBrushes are dual rotating brushes. In this model, they are empowered by increasing the number of brush rows to 12, which is 2 times more than in some other models. This shampooer is designed to clean as thorough as possible, to dig deep into the fabric and lift up even the dirt that was stuck there for years. Customers, who use this machine for the first time often are amazed by how powerful it can combat stains and other contamination and make the carpet look like a new one. A shampooer that is aiming at removing stains and dirt is obviously more effective when it sprays warm, not cold, soapy water. Of course, you always can pour warm water into the tank and clean, but what if something gets your attention and you have to leave a shampooer waiting for a while. When you return will you still be washing your carpet with warm water? With this machine, the answer is yes because it is equipped with special HeatWave technology that keeps your cleaning water warm. This is one of the many reasons why this carpet cleaner gives amazing results. One useful feature that Bissell DeepClean Deluxe Pet has is called the CleanShot trigger. Let’s say you clean your carpet with a shampooer and right in front of you in the way there is this stain. You doubt whether the machine can remove it, you understand that some extra detergent would be good to use on that spot. This shampooer knows exactly what you need. Just one pull of the CleanShot trigger and your machine sprays the spot with a concentrated solution. Very simple and effective help in removing stains. The EdgeSweep brushes allow this machine to clean edges of the carpet right to the baseboards. No missed lines along the wall that you have to clean yourself afterward. This machine knows that the task is to clean the whole carpet, leaving nothing behind. The Surround Suction is the feature that helps to take more water back from the carpet to the dirty water compartment. The more water is removed, the more quickly the carpet gets dry. Fast carpet drying is also one of the strong points of this shampooer. The Bissell DeepClean 36Z9 allows you to clean 12 inches wide path. This is wider than some other upright carpet cleans do and it helps to cover a bigger area in less time. Machines with wide cleaning path are surely preferable if you have large carpets to work on. The water tank of this machine is 1.25 gallons. While most carpet cleaners are equipped with a 1-gallon tank, this model allows you to use more water, and to clean more without refilling. The big water tank doesn’t imply that the machine is large and difficult to operate. The “bladder” design allows using one tank for clean and dirty water without mixing them. The clean water is placed into a special strong bag inside the tank. As the water is used and sucked back from the carpet, it returns to the tank but remains outside the clean water bag. Single tank design makes the shampooer smaller and more maneuverable. You don’t want pet hair to stick to the sides of the tank. Bissell doesn’t want this to happen either. That is why this shampooer features a small filter that is called Pet Hair Basket. This is a small basket that stands in the way of dirty water before it gets to the tank. All the fur and small pieces that get into the machine with the dirty water are trapped inside this basket. The trapper is set right on top of the water tank and is very easy to remove, clean and return to its place. This Bissel machine is equipped with a Stain Trapper tool. It is a special attachment that allows you to clean separately a small spot of mess, which may be your pet’s “accident” that happened right there, on your clean carpet. Then, without contaminating the whole machine, you attach the Stain Trapper that has its own small container for dirty water where all this mess goes while cleaning the spot. Then you empty this container and rinse it. The length of the cord is 22 feet. The long cord allows you to clean the room not worrying about where to plug in next. With this model Bissell gives customers 3-year limited warranty. It is one or even two years more than a usual warranty period for this type of machines. Though there are lots of different carpet cleaners available, Bissell DeepClean 36Z9 is still worth your attention because of its many useful features and tools. The HeatWave technology for effective cleaning with warm water, the powerful Surround Suction to lift as much water back as possible, Pet Hair Basket, large 1.25-gallon tank, which is the only tank attached to this maneuverable cleaner, and there are many more advantages of the model. Users love this shampooer, especially for the CleanShot trigger. While cleaning any carpet, it is recommended to apply an extra amount of cleaning solution to difficult stains. Even though CleanShot is extremely helpful, not every Bissel shampooer is equipped with it. The 36Z9 model luckily has this trigger, and it also contributes to its powerful cleaning abilities. If you are cleaning your carpet and have a difficult stain on your way, press the CleanShot trigger, and the shampooer will spray the stain with cleaning solution. One feature that this shampooer is built with is the Pet Hair Basket that keeps your machine clean from clotted hair. Another amazing feature is the Stain Trapper tool. It is a handheld tool that can be attached to the machine and has its own container, where the dirty water goes after cleaning out a small spot of contamination that you want to remove. It can be a pet mess or vomit, or just any small undesirable dirt on your carpet. You can clean it out without contaminating the whole shampooer tank with it. You will only need to empty and rinse this little container in your Stain Trapper tool. The DeepClean Deluxe 36Z9 is one of the best upright carpet cleaners in its price range for homes with pets. Let us compare it first to similar Bissell models. the nozzle is additionally strengthened for better cleaning. Considering that the price for Pet Carpet Cleaner 17N4 is almost $70 less than for DeepClean Deluxe 36Z9, users often choose the less expensive model, especially when their carpets don’t normally get too many difficult stains. The features of Pet Carpet Cleaner 17N4 and its ability to clean are also good and completely satisfy many users. So, in this case, we can agree that maybe you shouldn’t pay extra $70 for just several additional features. However, sometimes there are sales at Amazon and other places where you can buy Bissel Deluxe 36Z9 for a lower price. In this case, when the difference is not so big, it is reasonable to choose this cleaner and enjoy all the innovative features that Bissell added to this model. 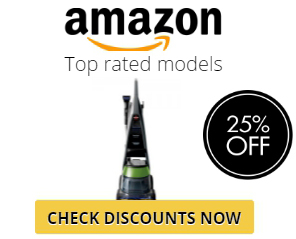 Indeed, they are not some extra tools that will never be used, on the contrary, you will enjoy every feature and option that this amazing cleaning machine is offering you. Comparing to Bissell ProHeat DeepClean Essential 8852 and Bissell Proheat 2X Premier Carpet Cleaner 47A23, the Pet Carpet Cleaner 36Z9 has more features for cleaning homes with pets. It contains the Pet Hair basket – the feature that is only present in pet models 36Z9 and 17N4. The Pet Hair trapper cannot be bought separately and installed on models that didn’t have it in the first place. Also, the 36Z9 model has the CleanShot trigger that allows spraying stains with an additional amount of cleaning detergent. The Heatwave Technology in the 36Z9 model makes sure you are cleaning with warm water. Though it doesn’t have a built-in heater like the Bissell ProHeat 2X Cleaner 66Q4 model does, but it uses the warmth of the machine’s engine to heat up the soapy water before it is sprayed onto the carpet. The Bissell DeepClean 36Z9 has some features that are absent in Hoover’s machines. For example, the Pet Hair basket to collect pet hair, the Heatwave technology to keep water warm, and some other useful things. 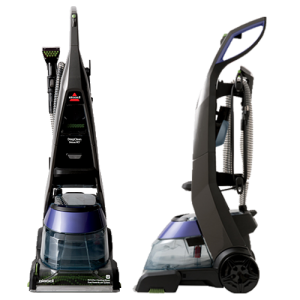 The closest models to compare with Bissell 36Z9 are Hoover’s MaxExtract Dual V and MaxExtract 60 PressurePro. Most manufacturers advise to use their own solutions with their machines, and Bissell is not an exception. This is not an attempt to get some more profit selling the detergent, as it may seem at the first sight. Each company designs the washing solution according to the machine’s features to prolong its life and get the best cleaning results. Each machine is built differently and has its own carpet cleaning procedure. That is why for Bissell machine we recommend buying the Bissell cleaning solution. Customers prefer Bissell 2x Pet Stain & Odor Full Size Machine Formula and Bissell 2x Professional Deep Cleaning Formula. It is convenient to purchase a big bottle of solution together with the machine.